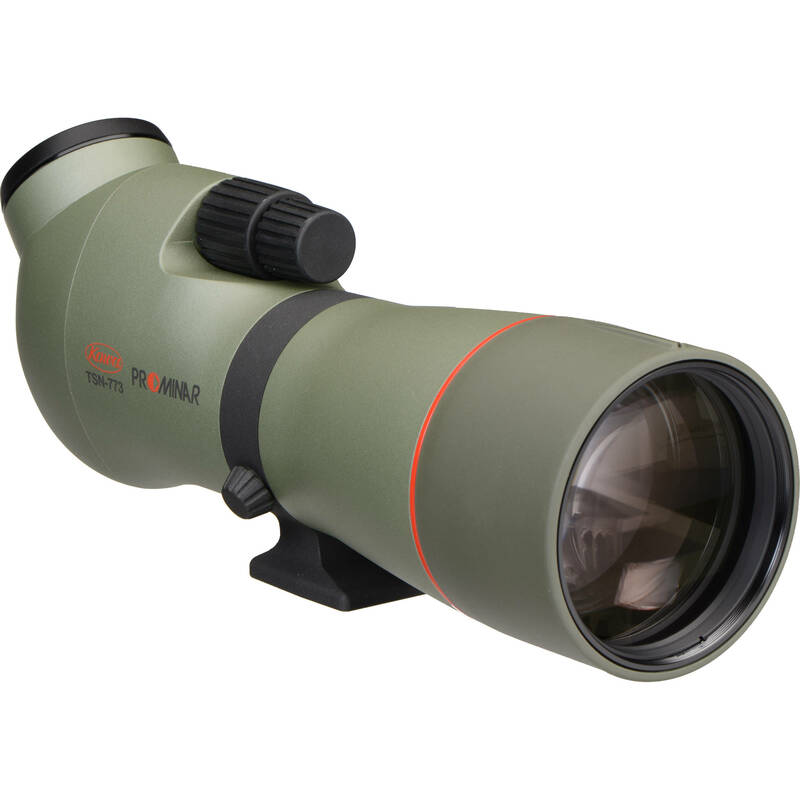 The Kowa TSN-773 77mm PROMINAR XD Spotting Scope with Angled Viewing is a scope of world-class caliber that redefines the standards of color brilliance, detail sharpness, and edge-to-edge brightness. Logically tailored to the most demanding outdoor enthusiast, every technical and ergonomic detail that went into the development of the TSN-770 & 880 series spotting scopes has been examined, perfected, or completely reinvented. This version uses an element of XD (extra-low dispersion) glass in its construction, which greatly minimizes chromatic aberration. This greatly enhances the clarity for crystal-clear images and high color accuracy. Use of Kowa's patented C3 multi-coated optics has made it possible to increase image brightness significantly over prior-generation models. The advanced lens system of these scopes achieves minimal to zero chromatic aberration even at higher magnifications, with consistent high image brightness. The housing is made of magnesium alloy that is designed for maximum durability and lightweight body construction. The result is a compact, ergonomic, and functional design for the die-hard enthusiast who wants only the very best. C3 Coating is a highly reflective multi-coating of dielectrics. This allows for a much higher reflectivity than with coatings of silver or optically enhanced aluminum, offering a reflectance of 99% or higher across the entire visible spectrum. Not only does this provide bright and sharp images, but accurate color reproduction is also achieved. The innovative inner focus system decreases image movement when focusing on objects, even single handedly. The focus system has the ability to focus from 16.4' (5 m) to infinity in two quick revolutions of the focus knob, ensuring consistent viewing. The waterproof housing meets the rigorous standards of JIS Protection Class 7; it is also charged with dry nitrogen gas to prevent fogging. Multiple interchangeable eyepieces are available, including 20x-60x zoom, 30x wide, and 25x LER for total versatility in the field. The eyepiece locking mechanism prevents the eyepiece from falling out or getting lost. Converters allow users to utilize eyepieces from other Kowa spotting scope series. Quick-aiming sightline aids in object locating. Sliding sunshade shields unnecessary light and raindrops while providing protection for the front element (which has an 82mm filter thread). Adaptable to 35mm SLR cameras, digital cameras, and video cameras with optional accessories. Box Dimensions (LxWxH) 16.8 x 6.75 x 6.65"
TSN-773 77mm PROMINAR XD Spotting Scope (Angled Viewing, Requires Eyepiece) is rated 5.0 out of 5 by 8. Rated 5 out of 5 by JL from Near perfect birding scope I decided on the 773 over the 883 mainly because of the ligher weight and slightly smaller size, but there is a significant price difference as well. I use only the 30X eyepiece and it's excellent. I prefer the wide easy view of the 30X over the zoom and it shows you all the detail you need to see 95% of the time. For me the trade off is worth it. Materials, appearance and image quality are all first rate. The only minor knock is that the coarse focus is a bit stiff, though I expect that will change with more use. The size, weight, optical quality and ease of use make this a near perfect birding scope. Optically the 773 has been rated equal to or above all but the 88mm Kowas, and considering that it's actually something of a bargain. Rated 5 out of 5 by Anonymous from TSN-773 quite impressive I just received the Kowa a few days ago. I have used it to view eagles from distances of 100 yards to 500 yards away. The air was crisp and clear and I was able to compare to my smaller 50mm 12x-36x scope (not Kowa) as well as my Canon 5d mkII with 100-400mm zoom and 1.4x teleconverter combo. I know...not apples to apples, but I figure it might be interesting comparison for photographers or for owners of budget scopes to compare to a high end scope. First off, the economical 50mm 12x-36x is very nice at 12x in good light. That is where it ends though. Zooming into the 24x-36x range or viewing things in low light are simply not that great. The loss of sharpness and brightness as you zoom makes you want to just view everything at 12x. It seems you get what you pay for. For the money though, it is good optics at 12x and will fit easily in a backpack so light as if it wasn't even there. Next the Kowa 773. Wow. superb sharpness through the entire 20x-60x zoom range and hardly a noticeable decrease in light at the 60x range. Very quality feel and construction. Make sure you have a sturdy tripod because 60x magnification will show any vibration. Sharpness is perfect edge to edge and so much brighter than the little 50mm 12x. but you do pay considerably more for the Kowa and it is bigger and heavier. The detail on an eagle at 60x at 200 yards is so impressive, you can see every feather distinctly as if you were standing next to it. Compared to the 50mm at 36x....well there is no comparison. Next the Canon setup. My pictures are fantastic, make no mistake, but looking through the viewfinder is dark and fuzzy by comparison at 560mm (400mm w/1.4x), which is not even close to the magnification of the Kowa at 20x. The Kowa is much brighter and sharper and a bigger image to look at. Rated 5 out of 5 by G.Gatsby from Middle weight price, heavy weight performance This scope punches way above its price range. Highly resolved images at almost all magnifications using the Kowa eyepieces. Sharp edge to edge. Pretty bright too for a 77 mm lens. Rugged construction. Best thing I like is the ease of focusing. The quick and fine focus coaxially mounted are super smooth. One finger operation. Rated 5 out of 5 by Anonymous from Better than the best..... I use the scope for spotting game and in the 300 meters shooting range. I was thinking on buying an European one because a need a very crispy optic to see the holes that 6,5mm bullets makes on the paper, and this scope is perfect . Rated 5 out of 5 by winnie from The View for You The Scope & eyepiece make a super combo! However, we purchased the optional KOWA TSN-EX16 Extender - pricey. But we can't mount it. In-order to mount it, you have to remove a collar from the body, and it will not come off. An E-mail inquiry to KOWA is 'lost in space' - no reply for a month. Rated 5 out of 5 by 6 FATRAT from World class scope NRA H.P, shooter, big game hunter. Superior optics reasonable weight. Rated 5 out of 5 by Kropp from Great scope I have one of these for work (bird surveys) and I've always been impressed with it. I understand it's not as good as the larger version, but its about $1,000 cheaper, and still has amazing brightness/resolution. The "work scope" I purchased has one of the 30x wide angle eyepieces that are no longer available. When I went to purchase one for myself, I wasn't happy that the 30x eyepiece was no longer available, since I was very impressed with the performance and it's amazing for eyeglass wearers. The zoom eyepiece is very expensive, but I went with that, since the only other option is a 25X eyepiece now, and I wanted the option of a little more magnification for personal use for birding. I've only owned my personal scope with the zoom eyepiece for a few weeks now, but I have to say the new zoom eyepiece is very impressive. At 25X and 30X (even a bit above) it is Extremely sharp, though it doesn't have the wide angle at 30X as the previous single magnification 30x eyepiece. I haven't looked through a ton of different scope models, but I will say I looked through some similar (slightly lower priced) and higher priced big name models. None were as good as this scope.